NEXT DOOR TO MY CHILDHOOD HOME lived Mr Piccolo. He had an interesting garage. Packed within its vast space were dusty bins, shelves, and boxes, inmates in his dark laboratory of experiments. Mr. Piccolo was a machinist. When not at work or helping his loving wife, he’d be in his garage. Making, fixing, or improving something. 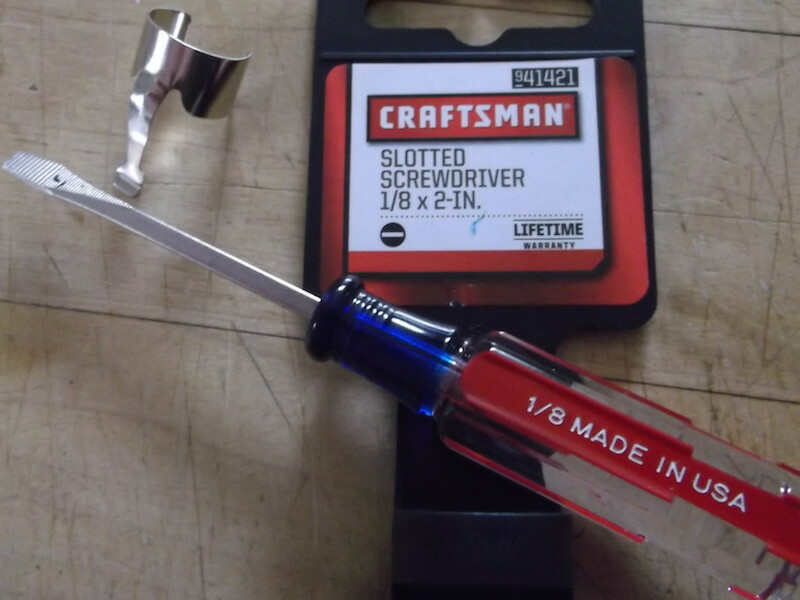 When still among my single digits, he gave me sage advice: “Buy Craftsman tools. Know why? If they ever break, Sears will give you a new one for free”. Even the magic word FREE was of little significance to a seven-year old. Tools were something other people used. Not me. I was more the Legos® and wooden blocks type. It took over a decade as tradesperson before I began buying Craftsman. Mostly their screwdrivers or tape measures. Sears is different now, victim to a hedge fund. Little remains of a Sears I knew even ten years ago. But the Craftsman name survives. My go-to poker for delicate work is their ⅛” x 2″ slotted screwdriver. Great for digging out threads from busted gas pipe. Or opening up a crack on Pete’s bouzouki top for better glue insertion. Hammered straight and filed sharp many times over its past two decades, she finally screamed, “ENOUGH”. Fisher’s Ace Hardware was the solution. The local Sears Craftsman Store had closed, but Fisher’s had a full selection, and honored the Craftsman Replacement Warranty. A fast, simple transaction later, I had a new screwdriver. Plus a roll of painter’s tape for Pete’s bouzouki refurbishment. Back in business, we are! This entry was posted in Product Review and tagged carl piccolo, craftsman tools, Fisher's Ace Hardware, jim sergovic plumber, mr piccolo cherry hill. Feb 25 (Reuters) – Sears Holdings Corp reported a deeper quarterly net loss on Thursday as falling sales during the crucial holiday season and an impairment charge overshadowed efforts by the retailer to slash costs. The owner of the Sears department store and Kmart discount store chains said its net loss attributable to shareholders came to $580 million in the fourth quarter ended on Jan. 31 from $159 million a year earlier. The results were in line with an estimate by the company, unveiled on Feb. 9, for a net loss of between $525 million and $625 million in the quarter.